The year-old bear in my neighbor’s front yard wasn’t much larger than a big Labrador retriever, but unlike a dog, the bear had a taste for bird seed. Standing on his hind legs, he stretched up high enough to just reach the bird feeder hanging in a mountain ash tree. He couldn’t pull the feeder down, but he managed to swing it hard enough to spill the black sunflower and millet seeds onto the lawn. As we watched, he licked the seeds up with his tongue and then ambled off down the street, looking for another easy meal. Bird feeders have proven to be a major attractant for urban bears. 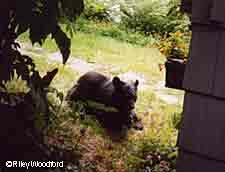 In Juneau, problem bears have been shot, and necropsies revealed bellies full of bird seed. Although the small seeds seem like an unlikely draw for a bear, bird seed is high in protein and fat, and is very appealing to bears. In the spring, bears eat emerging green vegetation, grass and any winter-killed carrion they can find. That low-protein, low-fat, carbohydrate diet is often insufficient to help bears regain the body weight they lost during hibernation, and throughout early spring bears are still partly subsisting off fat stored the previous fall. Bears may not begin gaining weight until the early summer berry crop kicks in. A bird feeder full of seeds is a major find for a hungry bear. An urban bear in downtown Juneau. Photo by Riley Woodford. “Bird feeders should be taken down between April first and November first,” said wildlife biologist Polly Hessing of the Alaska Department of Fish and Game. Because birds tend to be messy eaters and scatter their food, it’s also important to thoroughly clean up old seed from under the feeders. “In the spring and summer, there is plenty of natural food available for birds, and there’s no need to continue feeding birds after the first of April,” she said. The birds will be fine, and so will the bears.